Capture all 1D bar codes even when they're dirty or damaged. 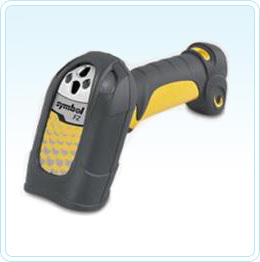 The rugged handheld corded Motorola LS3408-FZ bar code scanner features fuzzy logic technology for fast and accurate data capture. Two confirmation modes let operators know when a scan is successful. Premium scanning for all 1D codes including poorly printed, damaged or low-contrast. Withstands multiple 6.5-ft (2 m) drops to concrete and 2,500 3-ft (1-m) tumbles. Reduces user fatigue and ensures less down time due to accidental drops. Protects against water and dust to ensure reliable performance in harsh industrial conditions. Multiple modes of confirmation ensure positive user feedback in noisy environments. Delivers clearly visible line for precise, accurate bar code data capture. Compatible with emerging symbology to leverage your hardware investment. Decodes and transmits 14-digit GTINs where appropriate. Allows for easy replacement and upgrade. Enables presentation scanning and toggling between hands-free and handheld modes.